An electrician’s work is highly regulated by the individual states, as well as by local municipalities, as a matter of public safety, and therefore, in many states, electricians must be licensed. In many states, this license is only obtainable after passing an exam. Licensed journeyman electricians can work unsupervised on a job site under the direction of a licensed electrical contractor. A licensed master electrician can work unsupervised, obtain electrical permits and start and run a business. State exams will also include questions about laws and regulations specific to the state. 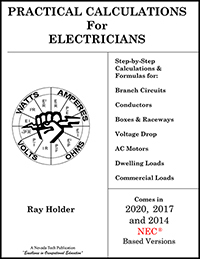 Most states that require electricians to be licensed also require that they hold a high school diploma or GED, and complete a 3-5 year apprenticeship program with a master or journeyman electrician before they are able to take the licensing exam. Some employers and unions require electricians to also have an associate degree. Local building departments administer the electrician’s licensing exam. To sign up to take the test, contact your local building department. Ask the building department for a blue print of the exam, which will provide information about the number and type of questions on the exam and how much time you will have to complete the exam. The blue print may also inform you of what score is needed to pass the exam. 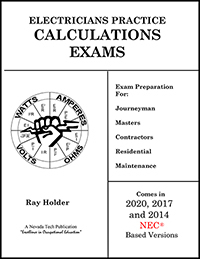 Exams typically have open and closed book portions and allow the use of the National Electrical Code Book where indicated. Some jurisdictions allow the use of tabbed NEC books. The journeyman electrician exams are usually held at governmental offices or local community colleges. Once you qualify to take the test and sign up for it, the local building department will inform you where and when the test will be conducted. The master electrician exam is used to determine whether a journeyman electrician has the requisite knowledge and skill that is necessary to become a licensed master electrician. The master exams differ from state to state primarily in terms of the questions involving the laws and regulations of the jurisdiction where the license is sought. To qualify to take the master exam, an individual typically has to have two years of experience as a journeyman electrician. However, some states may not require the applicant to have a journeyman license. If you have enough time in the field to take the master exam, you may be permitted to bypass the journeyman exam in some jurisdictions. 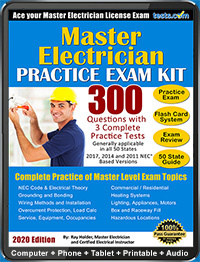 Some jurisdictions involve a business and law examination as part of the master electrician exam. The business and law exam consists of multiple choice questions covering such subjects in business management, accounting and federal and state laws related to the electrician’s trade. If you are a journeyman or master electrician and seek to move to another state, check to see if the destination state will require you to retest to work as a journeyman or master electrician in that state. Some states will honor a license granted in another state and it typically depends on what company administered the test and what score was achieved. If you are thinking of becoming a journeyman electrician or a master electrician, and want more information about qualifying for and preparing for these exams, please see our directory of test preparation materials and schools.